I think he has about 17, so far tonight. Is anyone going up at the end of March to see our boy play the Wizards? We already have our tickets. (02-26-2016 10:25 PM)LuckyLion Wrote: I think he has about 17, so far tonight. Is anyone going up at the end of March to see our boy play the Wizards? We already have our tickets. Is there anyone out there who would want to join me to see Baze play against Lakers or Clippers next weekend? I'm going to be there! Excited! He had a nice game today. (02-28-2016 06:37 PM)ODU_NYG Wrote: He had a nice game today. And with 14 points, he was the high scorer for the Hawks. Talk about spreading the points around. EDIT: I saw in the box score this morning that he was 2 for 2 on his three-pointers. If he was in a slump, it looks like maybe he is out of it. Solid game last night at Golden State (minus Curry). 35 minutes, 15 pts, 9 rebounds. Bazemore might of just needed to play well in that GSW game to get back on track... Which he did. Hopefully he and the Hawks get going and finish strong. I'd enjoy watching him play well in the playoffs.. He's worked so hard on his game. Kent finished with 6 points on 3-7 shooting in last night's win over Utah. He was limited to 28 minutes which was the second least among the Hawks starters and had 4 fouls. (03-09-2016 10:36 AM)ODU BBALL Wrote: Kent finished with 6 points on 3-7 shooting in last night's win over Utah. He was limited to 28 minutes which was the second least among the Hawks starters and had 4 fouls. Utah plays some really stingy defense. kind of an underrated team in that regard. Kent will get a nice contract this offseason. I'm concerned about Kent. His performance has been down significantly in recent weeks. I don't know if he has some kind of slight injury, if it is mental, or what that is affecting him. Today's newspaper shows that he scored 0 points in last nights game and was 0-9 from the floor, including 0-6 from three. I hope he can turn it around before he ends up losing his starting position. This is an important free agent year for him and ideally he would be putting up good numbers. Keep working hard and good luck Kent. Believe in yourself. ^ I read that as well. He was however +22 while he was on the court (2nd highest on the team last night). Had like 5 assists and 5 or 6 rebounds. He'll get back on track. Kent had a better game today against Indiana. Still didn't score too much though. He ended up with 8 points, shot 2-2 from 3, and 3-5 overall so at least he improved on his shooting. He only ended up playing just over 18 minutes. I don't think any of the starters played in the 4th quarter as Atlanta won by a large margin. Most of the other starters had in the mid 20's for minutes played. The coach got in his face and chewed him out about a defensive assignment during a timeout as he came off the court. It was on a fast break where he was back to defend and a guy ended up having a wide open 3 point shot that he made on the side that Kent was defending. Kent ran over to another guy to defend him instead of defending the guy that spotted up in the corner. Guess the coach wanted Kent to defend the corner guy on that kind of fast breaking play. Kent had a better offensive game last night against Detroit than what he has been having recently. He had 15 points on 2-4 shooting from 3, 3-4 shooting from the foul line, and 5-9 overall shooting from the field in the win over the Pistons. Hope he continues shooting like this the rest of the season and gets a nice pay increase in his new contract afterwards. (03-17-2016 10:17 AM)ODU BBALL Wrote: Kent had a better offensive game last night against Detroit than what he has been having recently. He had 15 points on 2-4 shooting from 3, 3-4 shooting from the foul line, and 5-9 overall shooting from the field in the win over the Pistons. Hope he continues shooting like this the rest of the season and gets a nice pay increase in his new contract afterwards. More importantly, last night was his first career double double. 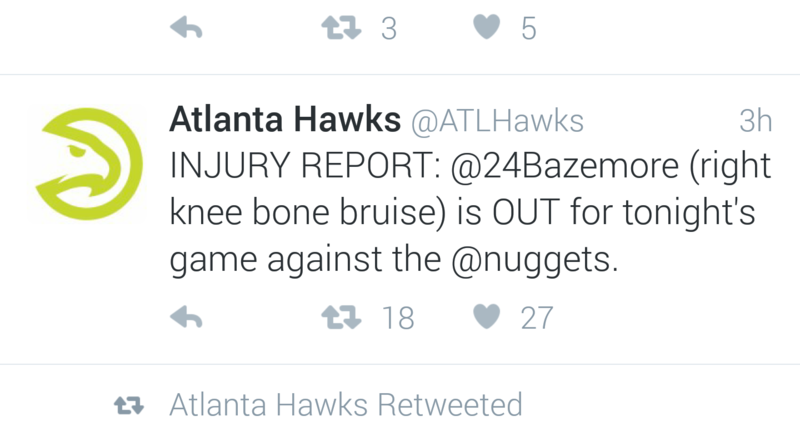 Anybody know why Bazemore is not playing this evening vs the Nuggets? (03-17-2016 09:07 PM)ODUsmitty Wrote: Anybody know why Bazemore is not playing this evening vs the Nuggets? Tim Hardaway Jr. started in place of Kent last night against Denver. It was his first start of the season and he had a great game - 29:34 minutes , 6-11 shooting, 2-4 from 3, 7-8 from the free throw line, 7reb, 4ast, 1 steal, 21pts with no turnovers and no fouls. Hope Kent comes back strong from his injury and still has his starting position when he does. It is important that he finish the year strong in order to give him some leverage in his upcoming contract season.